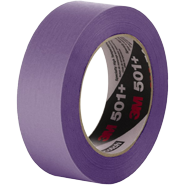 3M 501+ Masking Tape is a premium, high performance crepe paper masking tape that was designed for creating super sharp paint lines for many industrial painting applications, including high-temperature bake cycles of up to 300° F for 30 minutes. Provides a clean, one piece removal, leaving no residue. Instantly adheres to metal and other surfaces. Resists lifting or curling for sharp paint lines. Maintains integrity when formed around a corner. Controlled and smooth unwind dispenses evenly and is less likely to tear off of the roll.